Chuck Restic has achieved the American dream: a successful career with a large corporation, his own home, the best health care insurance and retirement package... but he's crumbling inside. Twenty years in Human Resources have pushed him into an existential crisis. He realizes there is so little value in what he does all day, and it is only when he embarks on a mission to find a missing employee from his firm that he truly starts to feel alive again. This is Chuck's first step toward moonlighting as a private detective - a job in which he turns out to excel. Constantly balancing the inane demands of his office and the excitement of his new "job," he finally finds what he's been missing. By applying his HR skills and wit to his new passion for detective work, Chuck unravels a web of crooked real estate deals and three murders, staving off a fourth: his own. 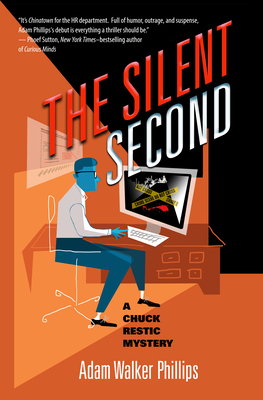 The first in a series of Chuck Restic mysteries, The Silent Second introduces readers to a sharp, witty, regular-guy detective who's rapidly winning fans. Adam Walker Phillips is the author of the Chuck Restic Mystery Series, which follows a burnt-out HR man who moonlights as a private detective. Phillips is a 20-year corporate vet who has endured countless PowerPoint decks, offsite retreats and visioning sessions, and synergies and synergistically-minded cross-functional teams in order to bring this mystery series to life. His sardonic take on corporate life brings a fresh voice to the classic detective novel. Phillips lives with his wife and children in the Eagle Rock neighborhood of Los Angeles.